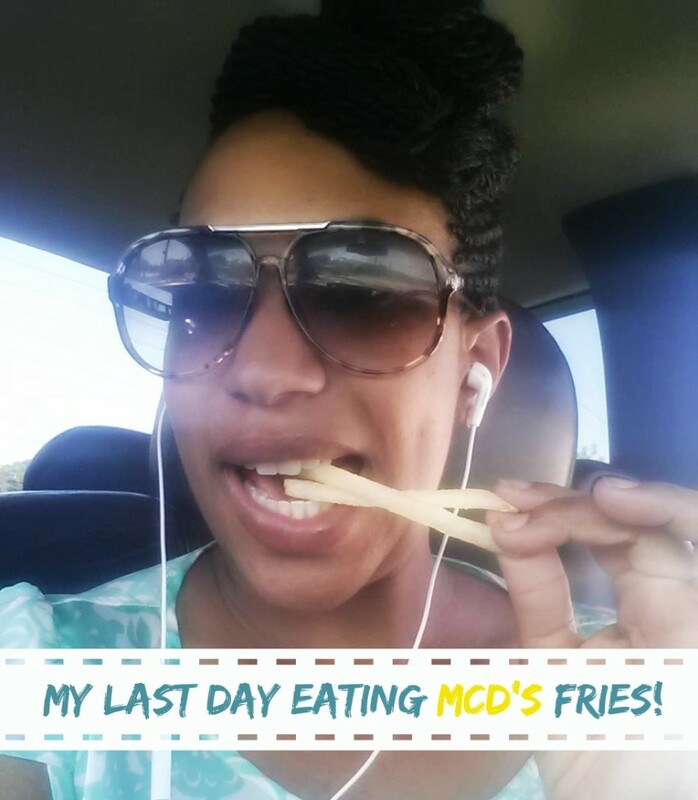 My Last Day Eating McDonalds Fries With 17 Ingredients! When I was a young lad, McDonald’s was the go-to restaurant. My mom took us there all the time. My choices ranged from the triple cheeseburger, Big Mac or chicken nuggets. The most important thing I had to have were the French Fries! I love fries and growing up, McDonald’s fries were the top on my list. Fast forward umpteen years later. I am now a wife & mother to my own children who also have come to love McDonald’s. Over the last 5 years, we have been doing better with healthy eating and researching what’s in our food. With movies like Food Inc. and Forks & Knives, I have cut down my meat intake to a couple of times a week. For the most part, I don’t eat at fast food restaurants anymore. It’s that 2% of the time that I would stop and get my old faithful french fries. 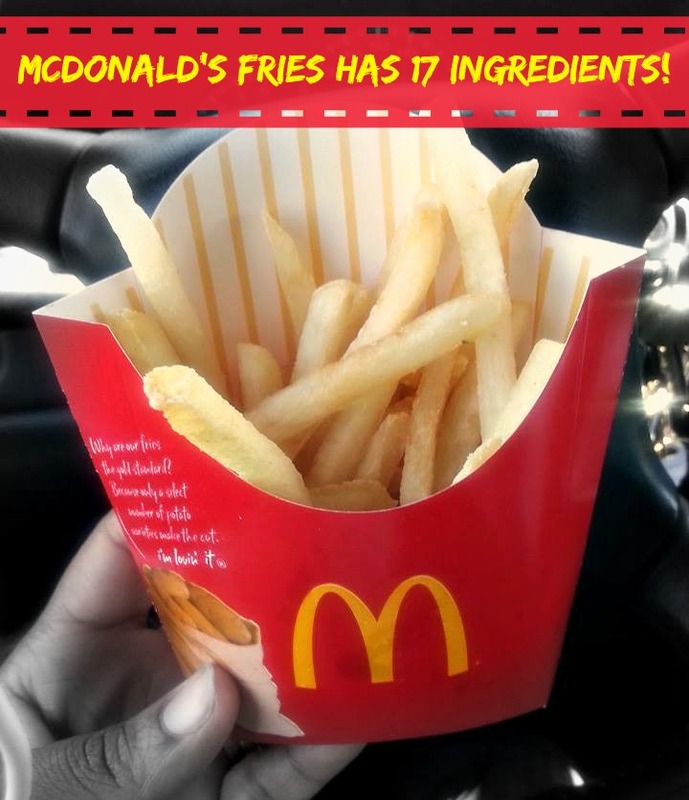 Well, McDonald’s published its french fry ingredients and it’s a list of 17! At home, I make the best fries. I even made a video about how I make Oven Fried Potatoes. I use two ingredients, Potatoes and Olive Oil. Why does McDonalds need 17 ingredients? After reading an article (the bulk is below), I decided I have seen my last days with their French Fries. I bought some and although they tasted the same as they always did, they tasted different because I now knew what I was eating. I am so tired of companies producing foods that have ingredients that harm us. No, it might not harm us the day we eat it but over the long haul, it will add up in our system. It makes you wonder why so many people are sick or just have health issues. I understand companies are in the business “to make money” but it is at the risk of your customers health? It seems so. Here are the 17 Ingredients: Potatoes, canola oil, hydrogenated soybean oil, safflower oil, natural flavor (vegetable source), dextrose, sodium acid pyrophosphate (maintain color), citric acid (preservative), dimethylpolysiloxane (antifoaming agent) and cooked in vegetable oil (Canola oil, corn oil, soybean oil, hydrogenated soybean oil with THBQ, citric acid and dimethylpolysiloxane) and salt (silicoaluminate, dextrose, potassium iodide). Many of the ingredients above are hazardous to human health, including those which are genetically modified (canola oil, corn oil, soybean oil), hydrogenated (soybean oil), chemically preserved and antifoaming (THBQ, citric acid, dimethylpolysiloxane), and artificially colored (sodium acid pyrophosphate). Source. Alcohol that taste like Water! Parents BEWARE! Nooo not my mickey d fries *cries* I am not a fan of McDonald’s burgers. I think in the past 5 yeas I have had a burger from them 3 times if that. I only eat their fries and sweet tea but I will have to stop eating those things. Fast places are beginning to get on my last these days. They are convenient but not good for you. Yes girl! It broke my heart! But my health comes first. I will continue to make them at home. Those may be the only tasty thing on McDonald’s menu, lol. I know I’ve made a mistake eating fast food, when afterwards no one feels good. Great post! Let’s talk about how I am so over McDonald’s. They lost me when I found out they were putting pink sludge in their food. Bleh. Yes Dee Dee! I haven’t had another chicken nugget since I saw that either! Thanks Candy!! Did you click on the link to see how I make the Oven French Fries! It’s super simple and super yummy! Now the question as bloggers is do we support and work with them knowing their food perpetration process is dangerous to our family’s health. Yesterday I went to a women’s conference and the keynote speaker pointed out several companies that I know most of us moms shop at that have no women on their boards or in executive leadership positions. I think we need to ban together and be more vocal on these issues once we find out about them so change can take place. Thanks for sharing this. Tiffini, I thought about this before I posted it. I know I might not be able to work with them again but that’s ok. I agree, we should be more vocal because these are our lives and children’s lives. 17 ingredients??? Goodness. I love their fries. I may need to make a decision as well to stop eating them. 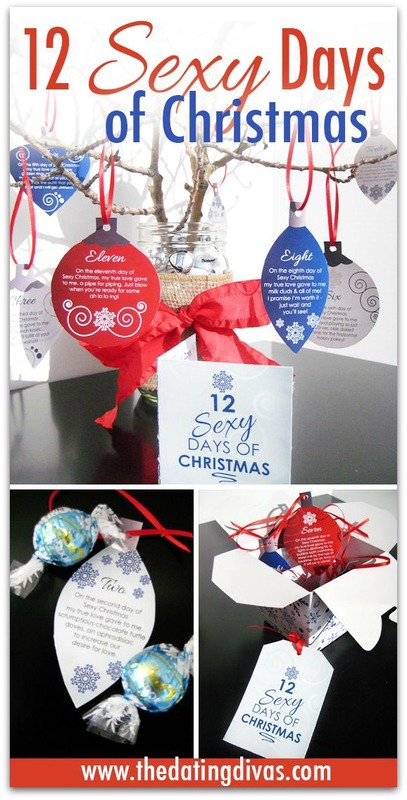 Thanks for this post, Bernetta! I love their fries but last time It was my bad when if bite ant :'( I was so scared and angry on their poor staff. Bad experience tho. Good for you, Bernetta! This is really wise decision for your body and health!